I really enjoy going to my normal hot spots to buy craft beer, and I see a new Lips of Faith bottle. These have quickly become my favorite series of beer releases, as they are always very creative, and unusual. Very one of a kind stuff. Cascara Quad is no different. This beer was brewed with dates, and if you are a normal person like me, you will know that dates are disgusting! hahaha! In the beer world though, brewing with such atrocities as dates or even raisins (yuck!) usually result in a pretty good smelling/tasting beer. The name Cascara comes from the coffee cherry, which is a berry found on coffea trees. New Belgium actually used Cascara Tea while brewing this beer. Two thumbs up to New Belgium on this wild adventure! Using my Jester King Snifter glass, this beer poured a very nice looking ruby/brown color which had a thick haze to it. The beer also had good carbonation, and had a thick tan colored head, which retained throughout the drinking session, and left a sticky film lacing down the glass. The aroma of this beer is exactly as I expected. Hints of all types of smells are going in with this one. I picked up on some chocolate, sweet molasses, slight coffee, spices, a small amount of funk/sourness with a cherry note. Yes, I even smell the dates in there as well. Each sniff I took, it seemed to have hit me with these different elements. Very exotic. The taste was just as complex as the aroma. I get a lot of the fruitiness in the overall taste of this beer with a cherry like flavor, those damn dates, and other dark fruits. There is also a solid taste of the malts leaving a taste of caramel or sweet chocolate. The lingering taste in my mouth is mostly the fruits, but there are some spices showing up at the end. Imagine making a cherry herbal tea, and throw in dates, raisins, or prunes in there to soak, then taking a big drink. This is what you have, except this one has alcohol in it! The mouthfeel of this beer has a full body, with a good carbonation bite. It is nice and chewy, left with a fair amount of alcohol burn in your throat. Overall, I will say that I am damn impressed by this beer, even with the dates! I still won’t eat dates, but disguise them in a beer, and I will happily drink it! 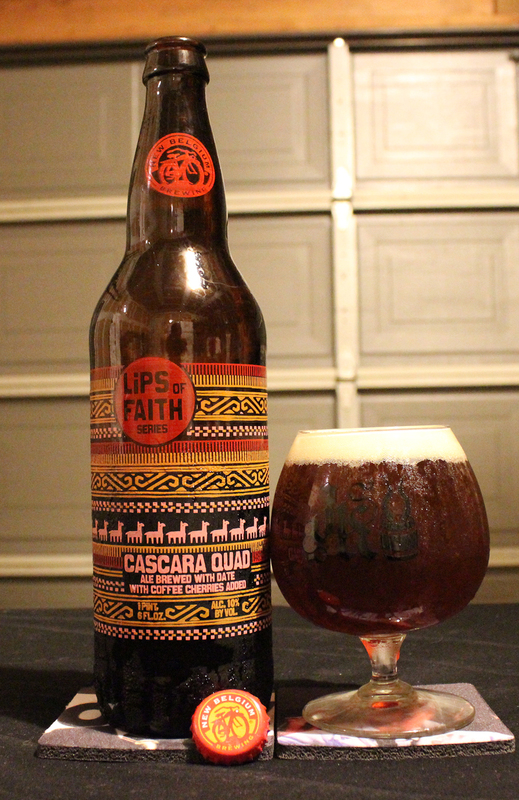 New Belgium, please keep up the good work with your Lips of Faith Series! As for the Metal connection, as soon as I saw the word Cascara, I immediately thought of the band CARCARIASS due to a resemblance of the spelling. I’m not sure how many people out there are fans of these guys, but I remember hearing a song from their debut album in 1997, and I enjoyed it, so I got each album they have released. Here is that song that introduced me to the band. Enjoy “Dream of Space” of their album Hell on Earth. No dates for this guy, BeerMetalDude!